As we slowly move our way through the anatomy of the human form for the artist, we move to a new group of neck muscles in this post. We move away from the vertebral and scalene muscles and on to a new batch of muscles located at the front of the neck. Today, we will look at the muscles that attach to the hyoid bone and control swallowing. 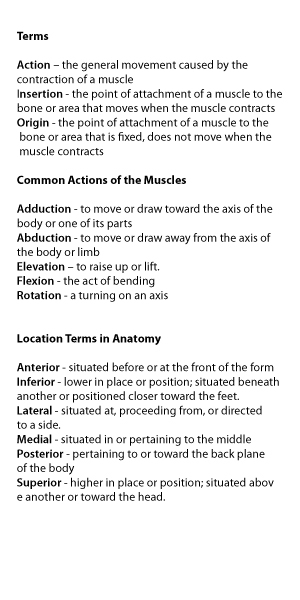 Like the other anatomy posts we will review the origin, insertion, and action of each muscle. The hyoid bone is another piece of the puzzle of the skeleton. The hyoid is a U shaped bone found in the neck, but it is not connected to the spine. The hyoid bone floats, in a way, as the bone does not abut or move in connection with any other bones. The hyoid bone moves down when swallowing. With the exception of one, the muscles we cover today are small and tucked away in the interior of the neck and under the jaw. These small muscles don't contribute as much to the shape of the neck as the sternocleidomastoid or other larger neck muscles, but they do play a role. The muscles connected to the hyoid move it, moving the larynx along with it. When someone swallows these muscles go into action and make the lump in the throat move. Again, the muscles below come in pairs again. The side view diagrams do not show this. Just remember that each muscle shown here has a partner on the other side of the neck. These muscles are connected to the skull, mandible, and hyoid. The muscle originates from two locations, the front of the jaw just behind the chin and the mastoid process at the base of the cranium. The digastric muscle assists in lowering the jaw and moving the tongue. Action: Lowers the jaw, moves the tongue. These are small muscles that assists in moving the tongue and the hyoid bone when swallowing. The geniohyoid muscle originates from the mandible, behind the chin and inserts at the hyoid bone. Action: Raise the hyoid bone and the tongue up when swallowing. This muscle group sits under the tongue and forms the base of the interior of the mouth. The mylohyoid muscle originates from the mandible from behind the chin and inserts at the hyoid bone. This muscle lowers the jaw and raises the hyoid muscle when swallowing. Action: Raises the hyoid bone and lowers the jaw. A long thin muscle that connects the hyoid to the scapula, this muscles pulls the hyoid bone down when swallowing. The omohyoid muscle originates at the shoulder blade and ends at the hyoid. This muscle is the only surface muscle of todays group and by comparison much larger that the others discussed. 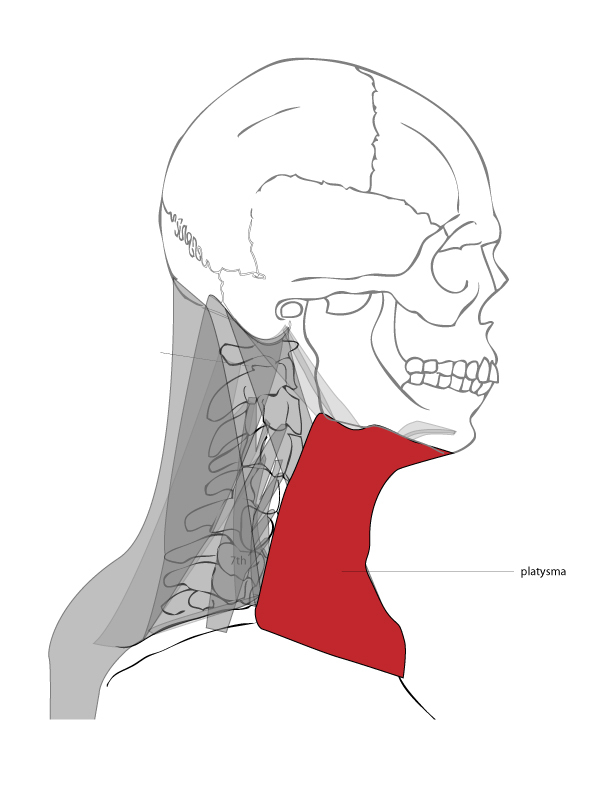 The platysma is a sheet of muscle that starts just below the clavicle and ends at the mandible. This muscle is an expressive muscle as it assists in moving the mouth and tightens the skin when fully flexed. This can create the look of anger or assist in making the body appear active. Origin: The area below the clavicles, just under the skin. Insertion: The lower area of the mandible. Action: Pulls down and widens the distance between the corners of the mouth, compresses the skin of the neck. Moving back to the smaller muscles we go to the sternohyoid muscles. This muscle originates at the top of the sternum between the clavicles and ends at the hyoid. 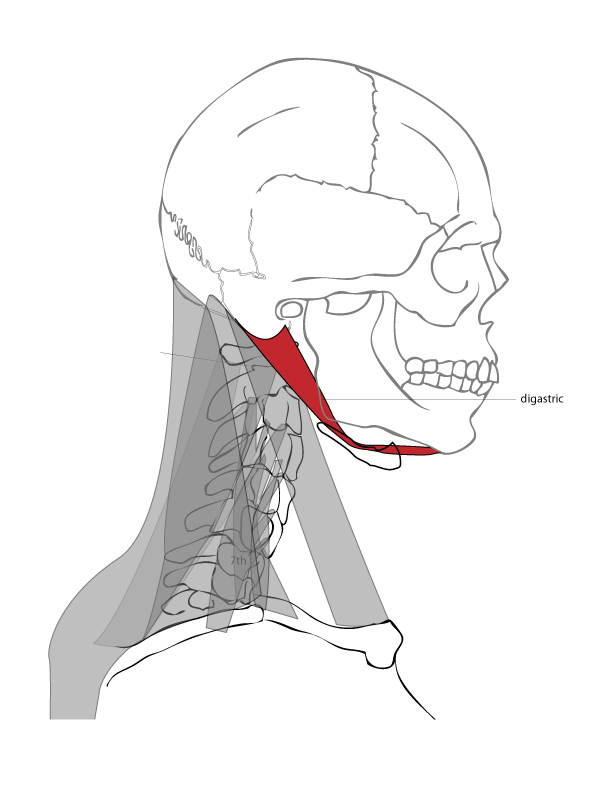 Like the other muscle with the insertion points at the hyoid, this muscle pulls the hyoid down. Like the sternohyroid this muscle originates at the sternum. The sternothyroid muscle does not connect to the hyoid bone however. Instead, the insertion point is at the cartilage of the thyroid. This muscle pulls on that cartilage to move the larynx down. This is another muscle that attaches to the hyoid and helps with swallowing. The stylohyoid muscle originates at the styloid process at the base of the cranium and ends at the hyoid bone. Origin: The styloid process at the base of the skull. Most of these muscles do not directly create visible forms we to use when we draw the figure, but knowledge of these muscles and how they work will be useful in understanding where the hyoid bone is at in any action associated with movement of the mouth, tongue, or neck. The next anatomy post we will look at the muscles of the torso.